Finding cheap wedding centerpieces is a priority for many brides. When planning your wedding, one of the most expensive areas can be decorations for the reception. However, there are many different options that can provide a beautiful atmosphere without breaking your budget. Two ideas to help cut down on costs is to use silk flowers and buying wedding supplies in bulk. Purchasing a large number of vases and materials at regular price will create a hefty budget. Look for stores like restaurant supply stores and places to purchase things at larger numbers. 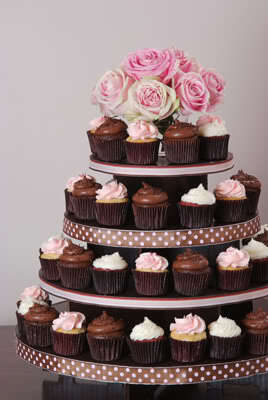 One cheap wedding centerpiece idea is to use the cake or cupcakes you are serving as the main centerpiece. For cupcakes, you can buy wire cupcake holders (they run about $2-$6 apiece) that you can place the cupcakes on. Use a colored piece of cloth underneath with some tea light candles around and you have created a very inexpensive centerpiece. A classy centerpiece that works well with any bright color and a brown theme is to use hurricane vases filled with coffee beans. Buying hurricane vases in bulk at a kitchen supply store cuts down on costs and buying coffee beans in bulk make a cheap centerpiece. Like the idea but you dont think using coffee beans is the way to go? To create a more colorful look use marbles. If you want to match your wedding colors you can use gem beads, beads meant to be placed within flower vases. Place a single silk bright colored flower or a candle in the center of the coffee beans (marbles, or beads) and set on top of a medium sized centerpiece mirror. Surround these vases with small tea lights and some glittered sequins or curled ribbons and you have a beautiful sophisticated centerpiece. 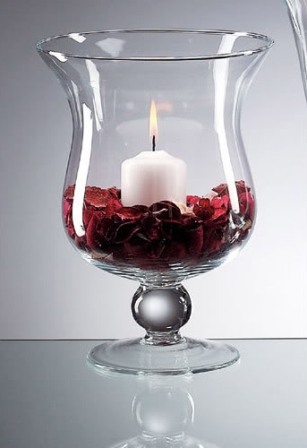 You can also put candles, flowers or flower petals in this beautiful container. Need more ideas for cheap wedding centerpieces? 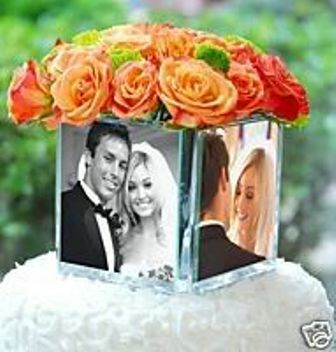 A third idea for cheap wedding centerpieces is to create centerpiece photo frame boxes. Find cheap photo frames that are the same size. Using brackets connect four frames together in a box shape and use the inside as a vase. Place pictures of the bride and groom in the picture frames. A variety of photos of the couple growing up and together will make cheap centerpieces that will give the guests something to look at as well as talk about during the party. A few silk flowers coming out of the center aren't necessary, but can create a unique look and help to match the party décor. Decorating the tables for your wedding doesnt have to break your budget. Be creative in how you look at possible centerpieces and see how you can make them yourself at a cheaper price. Using materials like silk flowers and smaller vases can significantly reduce your expenses. Most people dont remember a majority of your decorations so as long as you make it simple and classic they will enjoy their time watching you on your special day. There is nothing wrong with looking for cheap wedding centerpieces, you just need to be choosy when shopping.